If the ultimate goal for filmmaker and Oscar-winning screenwriter Jordan Peele is to continue to create a catalog of thrillers that challenge audiences to think beyond the visceral horror elements of the standard slasher flick, he's definitely on the right track with Us, the follow-up to his critically-acclaimed 2017 directorial debut, Get Out. 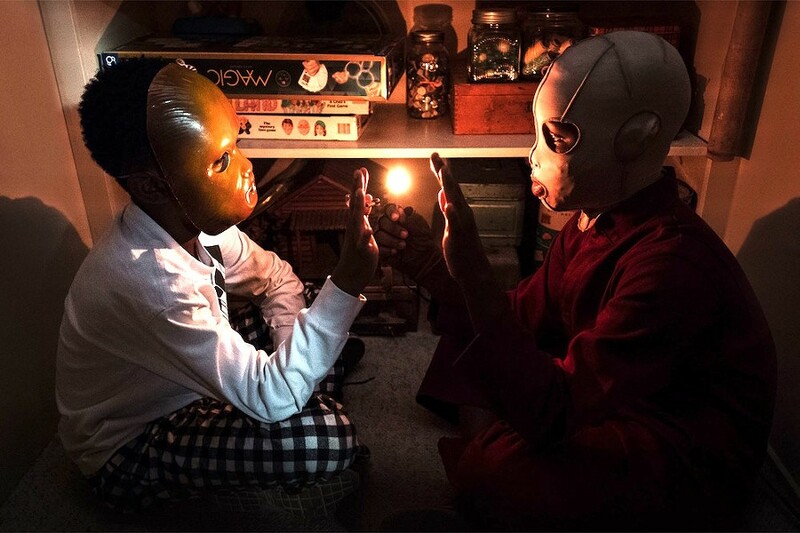 With Us, Peele, who focused on some fascinating racial themes in his first film, confronts other dark and discomforting secrets embedded in the fabric of America and does so from the pages of a highly ambitious and thematically heavy script that melds together typical home invasion tropes and political commentary that, while visionary, don't always stick the landing. Us tells the story of the Wilson family – mother Adelaide (Oscar winner Lupita Nyong'o), father Gabe (Winston Duke) and children Zora (Shahadi Wright Joseph) and Jason (Evan Alex) – who are on their way to their summer vacation home on the California coast. When Adelaide finds out Gabe wants to make a trip to the Santa Cruz beach to hang out with their longtime friends the Tylers (Elisabeth Moss and Tim Heidecker) and their twin daughters, she's not too keen on the plan. As a child, Adelaide experienced something so bone-chilling at that particular beach, returning to it makes her extremely anxious. They go anyway, make small talk on the sand, get spooked when Jason wanders off for a short period and ultimately end up back at their vacation home where the real terror is about to begin. Just before bedtime, Jason notices a family standing motionless outside at the top of their driveway. Before the Wilsons know it, the creepy family has infiltrated the house, taken them hostage and revealed them to be their doppelgängers. From this point on, the Wilsons spend the rest of the film running from the malevolent versions of themselves and trying to survive long enough for Peele to unpack everything he wants to convey in respect to the divisive state of the country and the disturbing issues that have been augmented by the growing contempt for those fellow Americans with clashing belief systems. Of course, all the metaphors and messages unleashed by Peele are up for thorough analysis. Us (U.S.?) is the kind of film that should be seen a dozen times, dissected and then written about in thesis form. The problem, however, is that the ambiguous makeup of Peele's sweeping ideas – as much as it allows audiences to explore and interpret multiple themes on their own (classism, wealth inequality, the phenomenon of synchronicity, social identity, the debate on nature vs. nurture) – feels excessive and detached at times. Still, Peele hasn't lost our attention for whatever high-concept project he wants to tackle next, including his upcoming reboot of The Twilight Zone, a classic TV series that seems ripe for a Peele reimagining. Maybe later Peele can remake the cheesy 1986 horror movie Chopping Mall, which features a shopping mall security robot that goes on a killing spree, so we can bear witness to his intricate perspective on the dangers of economic materialism, corporate greed and free-market anarchy.